Ajman Bank has firmly set the eyes on the leading role in the transformation of the UAE and the emirate of Ajman into a regional economic power. In our pursuit to achieve this goal, our Corporate Banking Group has formulated a strategy based on customer focus, product innovation and use of modern technology to integrate customers with bank's operations. We fully understand the complexity of businesses embedded in changing environments and have tailored our products to meet the demands and challenges of the corporate sector. 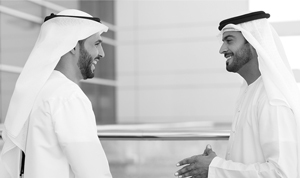 The main thrust of our strategy is on Large Corporates defined as companies with a minimum Turnover of AED 300 Mio, to cater their short term trade finance and working capital financing needs. Wakala/ Murabaha : To post finance trade transactions against Letters of Credit, Inward Documentary Collection (IDBC) and Open Account on short term revolving basis. To provide financing for Term Financing on partnership mode of financing used actively in syndicated transactions.